Do I Need A Break Tank (Type A Air Gap) For A Commercial Dishwasher? This article aims to provide advice to businesses assessing their requirement for a Break Tank (Type A Air Gap) when purchasing a commercial dishwasher or glass washer, such as care homes, nurseries, day care centres and hospitals. A break tank is often referred to as a ‘Type A’ Air Gap but must not be confused with a ‘WRAS approved non-return valve’ as it provides an entirely different method of operation. What is a Break Tank Dishwasher? A Break tank may be fitted to a commercial dishwasher to prevent any possible backflow of dirty water (containing food debris, contaminants, bacteria etc.). from the machine into the fresh water mains supply. They are installed into machines to ensure that there is no chance of contaminating fresh water supply. How Does a Break Tank Dishwasher Work? The break tank appliance works by feeding the incoming mains water supply into a separate tank first. This separate tank has an ‘air gap’ (a simple opening at the top that acts as an overflow). From this tank, water is then fed into the dishwasher. This ensures that in the event of a fault in the dishwasher causing a backflow, contaminated water can only ever reach back into the break tank before it overflows through the ‘air gap’. The result is that contaminated dishwater can never enter the fresh water inlet. Do I need A Break Tank (Type ‘A’ Air Gap)? UK Water Board Regulations require commercial dishwashers to be fitted a Break Tank (Type ‘A’ Air Gap) wherever an installation is rated as being at category 5 level of risk or higher. Generally, businesses rated at category 5 or higher will include any high-risk areas such as Schools, Care Homes, Nurseries or Hospitals where contamination of the water supply would be detrimental to hygiene and health. It is the responsibility of a business to assess their level of risk and comply with water board legislation. Where is a Break Tank Located? Machines listed with a Break Tank or ‘Type A Air Gap’ will have the break tank installed internally to the machine. This does not affect the machines performance, operation or dimensions. 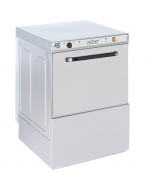 Any dishwasher that does not have a break tank fitted as standard can have an external break tank unit fitted later, although units are generally bulky and take up additional space. Not having a break tank will not affect the performance of the machine. It is possible your plumbing already has a device in the system at an earlier point which does the same job.